picketing with his older brother Clarence against local merchants who would not hire African Americans. Mitchell attended Garnet Elementary School, Booker T. Washington Junior High School, and graduated in 1940 from Frederick Douglass High School. Mitchell never shied away from a fight to improve minority conditions, and his family was involved in the Civil Rights struggle since the 1930s. 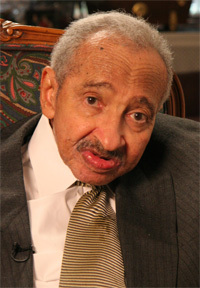 His brother—Clarence M. Mitchell, Jr.—served as head of the Washington bureau of the NAACP. Sister-in-law Juanita Jackson-Mitchell, a civil rights lawyer, was also active in the NAACP. 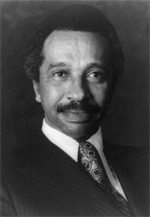 Parren’s nephew, Clarence Mitchell III, was a State Senator. Parren Mitchell served in combat in World War II as a commissioned officer. He received a Purple Heart for his service. He graduated from Morgan State College in 1950, and went on to receive a Master’s in Sociology from the University of Maryland—after a successful lawsuit allowed him to become the school's first black graduate student. (Mitchell was later inducted into the University’s Hall of Fame.) After college, Mitchell worked as a probation officer and supervisor in Baltimore, while simultaneously teaching at Morgan State. That departure led to Mitchell’s unsuccessful first bid for a congressional seat. After losing a close race, he returned to teaching at Morgan State and prepared for another run. In 1970, Mitchell ousted incumbent Sam Friedel, despite a vote count snafu in the primary, harassment and a firebombing incident at his campaign headquarters. Solid support in Baltimore’s black districts enabled his victory. A founding member of the Congressional Black Caucus, Mitchell’s eight terms in Congress were hallmarked by tenacious effort and countless hours working to ensure fair procurement opportunities for minority and disadvantaged business. In 1976, Mitchell attached a 10% minority business set-aside to President Carter’s $4 billion Public Works bill. In 1982, he amended the $71 billion Surface Transportation Act to ensure that 10% of contracted work went to minority enterprises. In 1985, at age 63, Mitchell announced that he would not seek a ninth term in Congress. During his retirement years, Mitchell continued his tireless activism. A scholarship for UMD students, sponsored by the Black Alumni Network, and several charitable trusts were enacted in Parren’s name. The Parren Mitchell Foundation gives awards to leaders in the African American community. In 2007, a post office in Baltimore was named in his honor. Congressman Mitchell died on May 28, 2007 of complications from pneumonia at Greater Baltimore Medical Center. He was 85 and had lived in a nursing home since a series of strokes several years ago.